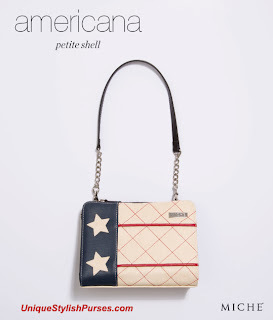 Show your patriotic side and great taste in fashion with the Americana Shell for Petite Miche Bags. Lightly-textured faux leather in rich antique cream is complemented by diamond-patterned contrast stitching, red and blue accents and appliqué stars. Perfect for watching fireworks or for any occasion where you want to show off the red, white and blue.